What has Science done? Click here to play! Years ago, when the Insectron people of Insectronen 5 came to Earth in their space flight machine, they came in peace. Despite their clearly high level of intelligence, the Union of Hubristic Scientists thought that it would be interesting to see how the Insectrons responded to loud bullhorns being blasted near their sensitive hearing organs. This was despite being told by the Insectron's perfectly in every Earth language (even Esperanto) that they really hated that, and it would be great if the humans could stop doing it. Science had other ideas, so the Insectrons were subjected to many a bullhorn blast in the name of research into how they reacted to loud bullhorn blasts. Results were inconclusive, as many times test results could not be recovered due to Insectron riots. Eventually, the Insectrons managed to get away from Earth, the most annoying place they'd ever been. Now, the Insectrons have returned with lots of heavy weapons, and they are really ticked off at Science and humanity. The Union of Hubristic Scientists immediately disbanded in response - citing "My bad" as the reason - and this first seemed to placate the Insectrons. Unfortunately, when the Insectrons tried to bring some of the scientists to justice, they became incredibly frustrated with human legal systems. Apparently, Insectrons let off a guilt pheromone that instantly determines whether an Insectron is guilty of a particular crime or not. When coming from a court like that and going to the kind of things that pass for courts on Earth... Well, it's not surprising that we now need fighter pilots such as yourself to kill every last Insectron out there. Jump into your personal space jet and start the take off sequence for your Outta Space Adventure. Thanks to a ridiculous military budget, you can win big bucks for rescuing scientists, killing Insectrons, shooting down enemy ships, and successfully working with your fellow Space Navy officers. Destroy the fiery Insectron home planet of Insectronen 5 to save humanity (and make good scratch at the same time) in the Outta Space Adventure slots. 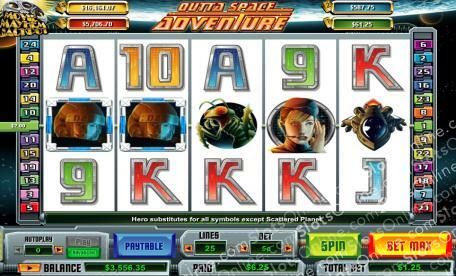 The Planet symbol is the scatter in this game, and it pays out on the total bet when 2 or more land on the reels. 3 or more symbols trigger 20 free spins, with a double prize multiplier during those spins. The Hero symbol is wild, and it can substitute for any symbol other than the scatter symbol.